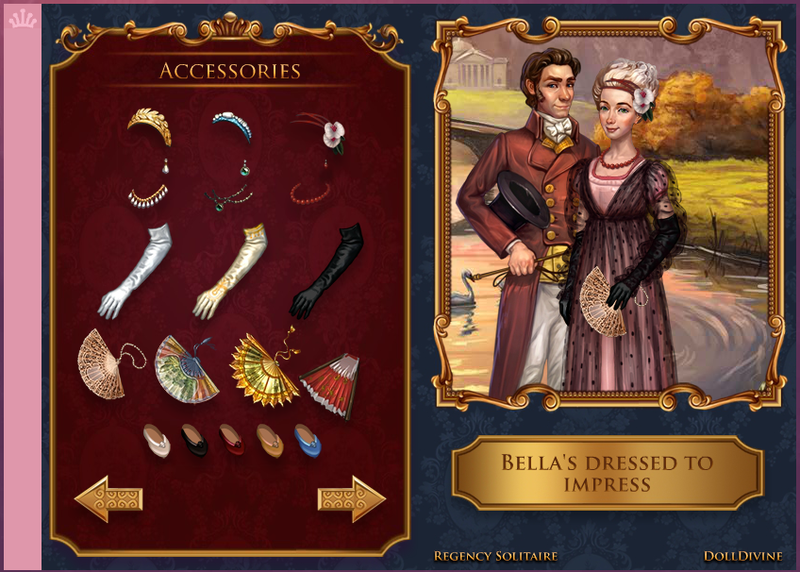 Grey Alien Games » Blog Archive » Dress Up Regency Bella! 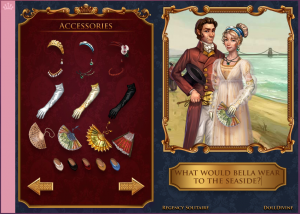 So many people have commented on the beautiful, high-quality artwork for Regency Solitaire that we wanted to do even more with it. We’re really excited to let you know that now you can dress your own Bella character – thanks to our friends at Doll Divine. And this game is totally free! Click Here to play it now. 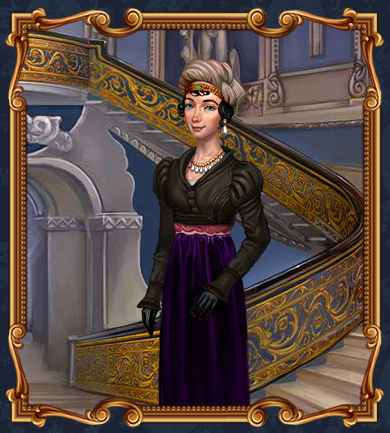 Doll Divine is perhaps the only dress up site making games adults and children of all ages to enjoy. “Each exclusive doll maker allows you full doll customization,” Ola says. We can’t express how much we love this game! This entry was posted on Wednesday, February 4th, 2015 at 2:15 pm and is filed under Grey Alien Games. You can follow any responses to this entry through the RSS 2.0 feed. Both comments and pings are currently closed. I love Regency Solitaire. The graphics are just beautiful. The reason for my comment is that I am stuck on level 18. I am unable to get a 3.0 no matter how many times I replay the level. Do you have any helpful hints to help me continue on past this level? Thank you for your help in this matter. I am actually on chapter 18. Hi Kathy, thanks for your comment. Chapter 18 is a tough one. To get a high multiplier or combo, it’s best to save up a lot of jokers and wildcards AND also powerups (cupid, lyre, phoenix) and also to identify a level which is easiest to get a long run on due to the layout of the cards. Then if you get a good run, but it’s not enough, start using the joker and all the powerups to keep the run going. Eventually you should be able to reach the goal. Good luck! I just went back into the game and the title of the level I am on is Woodland Stroll, which has the 3.0. The highest I could get was 2.9. I have tried using the powerups like you suggested but I still have not quite made the score I need. I let you know if I am able to get beyond Woodland Stroll. 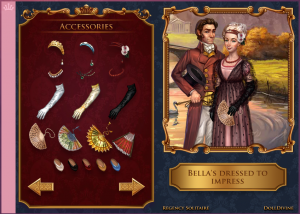 There is a free and safe hidden object game called ‘LIVE NOVELS-JANE AUSTEN’S PRIDE AND PREJUDICE” that you or your wife may enjoy playing. I was reminded of it after I purchased REGENCY SOLITAIRE. 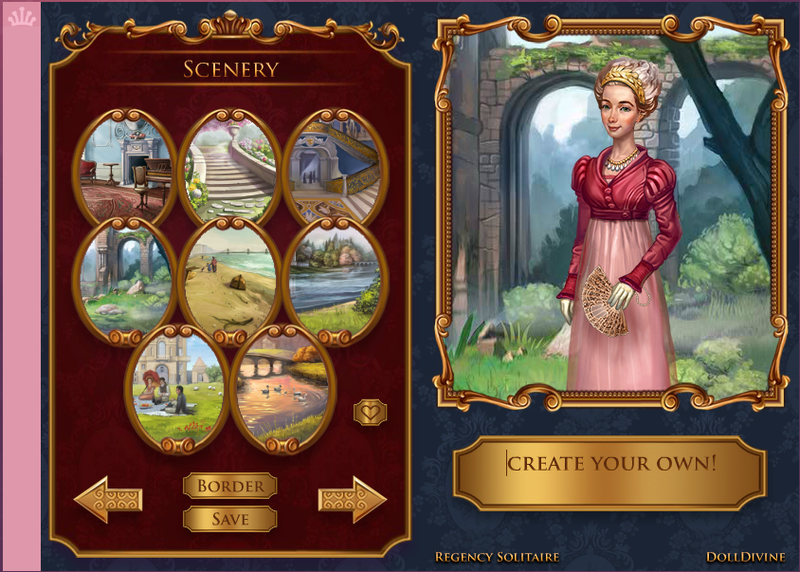 Both games are safe to play and are in the same historical time period as Regency Solitaire. Hope you will enjoy them both if you decide to play them. I have played them several times and they are wholesome and charming games. We need more games like that to be made. I was delighted to learn that you made HOLIDAY BONUS. I have played that game many times and just loved it. Thank you both again for making such wonderful and refreshing games. We need more developers like you with creativity to produce lovely casual games. Hi Dawn! Thanks very much for the links, we’ll check them out. Also glad to hear that you enjoyed Holiday Bonus a lot 🙂 Hopefully you’ve also tried Spooky Bonus, our most recent match-3 game, and also Spring Bonus which I made as a celebration of how lovely the Springtime is. I LOVE your games, Grey Alien…. 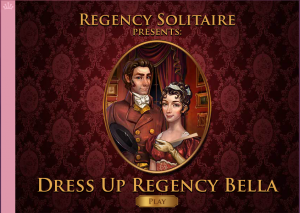 just purchased Regency Solitaire on BFG and voted for STEAM as I shop both places and will give me more choices in future. Please continue developing and offering your wonderful PC games…. yours are beautifully designed, the music is always engaging and appropriate and I own every one of your games in my vast collection of 100’s and 100’s of other pc games from every genre from adventure to HO. Obviously you’ve made an impression on me (especially beginning with your Halloween M-3) because I, frankly, have never written on any other developer’s blogs, despite the volume of games I own, lol. To me, your sound affects, voice, music and art work as well as, of course, the immersive-ness of gameplay, have been exceptional in your last 2 games and, again, I own and enjoy all of them. So, thank you for continuing to offer us PC games with quality and wholesomeness in mind. I’m glad you’ve noticed all the little details we put into our game. Every part of each game is made with care and attention, and we’ve got better at it over the years plus we work with great artists and a really good musician. We’ll probably announce the new project once the design is further along but I can say the we are planning another historical solitaire game!